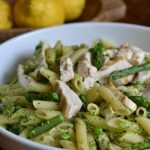 If you’re looking for a fresh, easy and delicious spring dinner, try this pesto pasta with chicken, asparagus and peas. 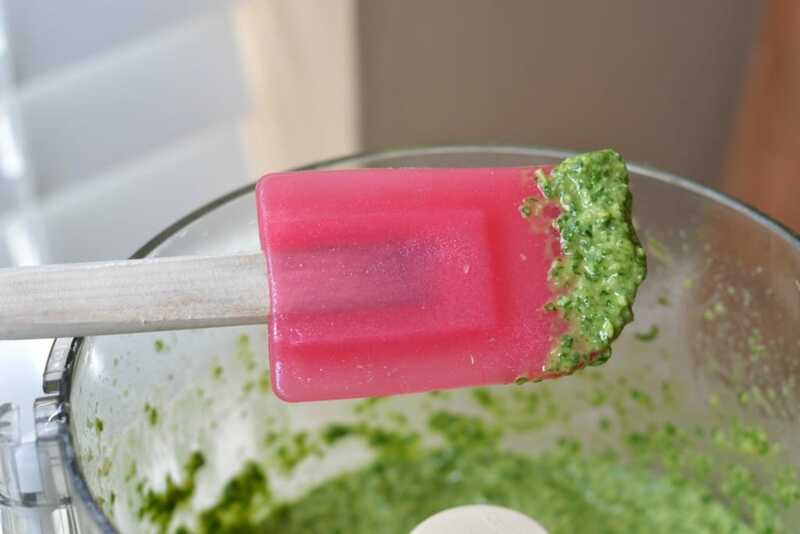 A few days ago, I posted my recipe for homemade dairy-free pesto. 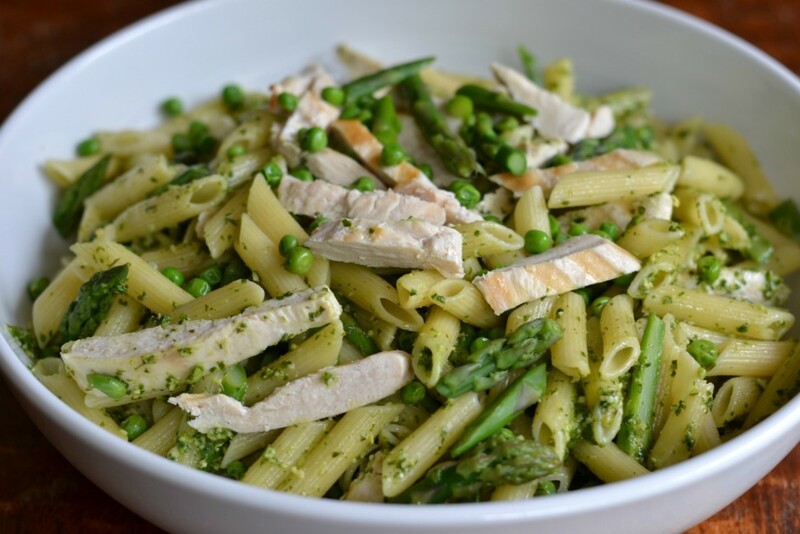 Pesto can be eaten in a million different ways, but one of my favorite ways to use it is in this delicious recipe for Pesto Pasta with Chicken, Asparagus and Peas. This meal is simple enough to make on a weeknight (especially if you make the pesto a day or so ahead of time), but it tastes and looks like a lot of work. It’s like spring in a bowl. One thing I love about this pesto pasta dinner is how versatile it is. You can modify it in many different ways depending on your tastes and what you have available in your fridge or freezer. Swap in some haricot verts or snap peas for the asparagus if you’re not an asparagus fan. And you can use any type of pasta your heart desires. I like using penne with pesto because the little ridges help grab onto the sauce, but any type of pasta noodle will do. Finally, you can choose to omit the grilled chicken if you want to make it a vegetarian or vegan dish, OR you can substitute salmon, rotisserie chicken, or shrimp. The possibilities and combinations are endless! 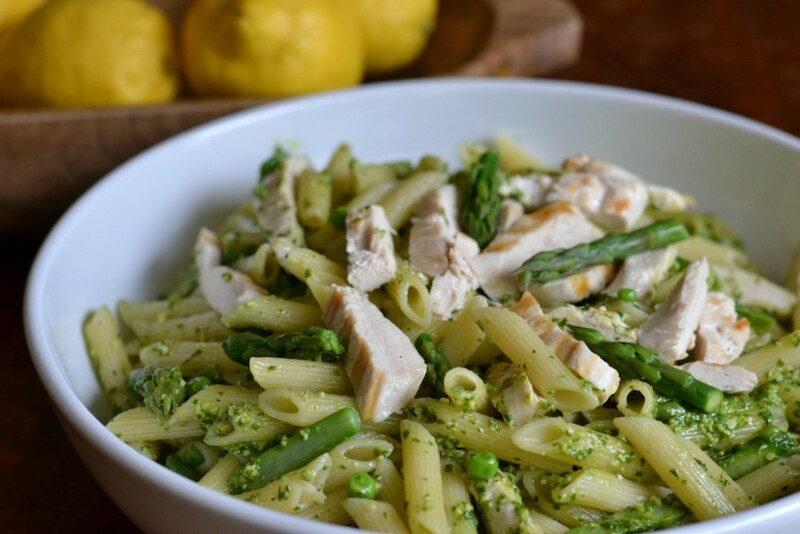 While I obviously recommend using my homemade pesto recipe in this dish, you can easily swap in store bought pesto if you’re in a hurry, or any other pesto recipe you already know and love. And to make this pasta dinner more versatile still, you can choose to serve it hot out of the pan, or let it cool to room temperature. When I’m entertaining, I love serving foods that taste just as good at room temperature as they do piping hot because it eliminates all of the last-minute running around. Just plop the bowl of pasta in the center of the table, take a deep breath of accomplishment, and let people eat whenever they’re ready. It also makes great leftovers for lunch the next day. I will say that the one bonus to serving this dish hot is that you can shave some fresh parmesan over the top and watch as it slowly melts into the warm pesto and pasta. Since I don’t cook with cheese due to the allergies in our house, it’s my favorite way to get my cheese fix at dinnertime. 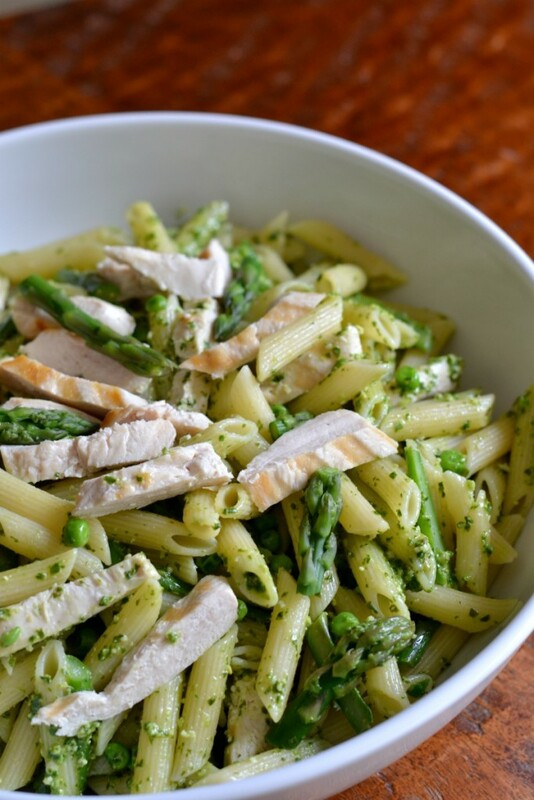 This pesto pasta with chicken, asparagus and peas is like spring in a bowl. Make it with homemade pesto or store bought. On a grill (preferred), grill pan or skillet, cook chicken breasts until done. Set aside to cool; slice in thin strips. In a large pasta pot, boil water, salting generously. When water boils, add pasta, setting a timer for the pasta cooking time (according to box instructions). During the last two minutes of the cooking time, add the asparagus and frozen peas. When pasta is al dente and peas/asparagus are tender, drain into a strainer. Add to a large bowl and toss with pesto and chicken. If desired, top with freshly shaved parmesan cheese. What do think of substituting quinoa for the pasta? I was always intimidated to make my own pesto, but it actually isn’t that bad, and so worth the fresh taste. This recipe looks delicious, thank you for sharing at Merry Monday!